Summer is coming! Beach time and Pool time are almost here. I can see that people are starting to open up their pools for the season and making plans to head to the beach when the weather gets warmer. The outdoor parties are getting organized for the beach, parks and pools! Such a nice time of year when everyone comes out of their homes again! Today I made a beach party card! Are you heading to the beach this summer?? 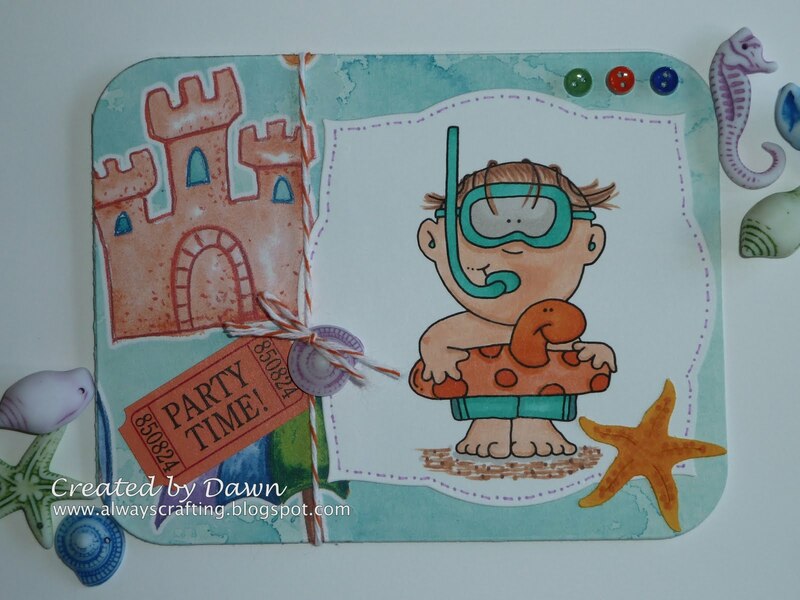 Dawn- I love it....I always love the beach cards. Dawn, that is sooo cute! I've noticed lately you have been mixing stamps w/ stickers. What a great idea. Keep on creating & sharing! Very cute! I wish it was beach weather here! Very nice. Is the little castle in the background a stamp also? The castle is part of one of the papers I used. Adorable!!!! Wonderful colors and details, love it, thanks for sharing it with us at CCCB! This is just as cute as can be! Thanks you so much for playing along at CCCB! Oh my gosh.. This is adorable.. Thanks so much for playing along with us at CCCB!